How often should I bathe my Labradoodle? How can I make my Labradoodle smell better? Your search for the best shampoo for Labradoodles can be a tough one when one lacks guidance as there are lots of products in the market. However, like always, We’ve got you covered! The Labradoodle is a mix between a Poodle and Labrador Retriever. The amazing personalities of both dog breeds brought together to create the intelligent, loyal active Labradoodle. Labradoodles often look almost the same, but their behavioural characteristics and temperament can vary greatly. 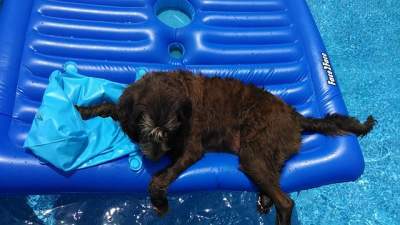 One thing we know is that unlike their lab and Poodle parents, Labradoodles have a liking for water. And we all know that a wet dog is a smelly dog! One big pro of owning a Labradoodle is they don’t need frequent baths. These fun-loving dogs have a coat that mud and dirt will likely fall right off of, but Labradoodles are known for enjoying a leisurely in what you’d consider “somewhat gross”. When shopping for a shampoo for your Labradoodle, you’ll want to consider different factors. Labradoodles have various coat types, which means you’ll want to choose a shampoo based on your dog’s fur. Labradoodles do not have an undercoat, so extra conditioning or deep-cleaning shampoo is not needed. If your doodle enjoys getting into smelly things, it is best to choose a shampoo that won’t dry out their skin if bathed frequently. If your dog has a sensitive skin or allergies, make sure you choose an all-natural organic shampoo so you don’t exacerbate their condition. Choose to comb out any knots, mats or tangled fur before bathing your Labradoodle. You can do this with a brush or tooth comb. You may even need to do a little trimming around sensitive areas if they are badly matted. Labradoodles not only differ in personality type, they also differ in coat type. Your doodle may have a curly, rough hair, or they could be straighter, thinner hair. Is your labradoodle starting to shed? Whatever the case is, you will definitely want to make your final shampoo decision based on your dog’s needs. Overall Best Labradoodle Dog Shampoo: Buddy Wash produces a series of top-rated dog shampoos. The mint and lavender formula us made with natural ingredients to soothe and rejuvenate your Labradoodle’s coat. It is no wonder it is voted best smelling puppy shampoo last year. Buddy Wash is also made with botanical extracts and essential oils which are best for irritated or itchy skin. The blend of green tea, rosemary, chamomile, and aloe Vera in Buddy Wash Original Lavender & Mint Dog Shampoo will shine up your doodle’s coat and leave it feeling super soft. Pros: Soap-free and made in the USA. It comes with wheat protein, which acts as a natural deodorizer. Lavender properties will help calm your Labradoodle during bath time. The lavender also has anti-fungal and anti-inflammatory properties. Best Shampoo for Labradoodles with Allergies: Does your Labdoodle have allergies and sensitive sin? We recommend you try this best shampoo for Labradoodles with allergies or a sensitive skin. Made from natural ingredients that include tea tree oil, oatmeal and D’Limonene, which help moisturize and soothe the skin. The formula is created to help wash away any allergens on the skin or on the fur while relieving irritation and itch. Vet’s Best dog shampoo for odor will leave your dog smelling fresh after bath time. Pros: Will not affect topical tick and flea treatment. You can use this shampoo more often without it drying out your doodle’s skin. Made with natural ingredients and essential oils. Made in the USA. Here, we are going to talk briefly about some of the other products we came across while researching this article that we think are worthy of a shout out. They are all amazing alternatives if you didn’t like the look of our top two recommendations above for some reason. If your Labradoodle has incredibly sensitive skin, our pick from Jax n Daisy might be a perfect solution for you. The shampoo is a blend of lavender, witch hazel, rosemary, lemon oil, hemp, chamomile and grapeseed oils. This natural mixture quickly relieves pain associated with dermatitis caused by bacteria, fungi or allergies. TropiClean Luxury 2 in 1 Papaya & Coconut Dog Shampoo will not only make your Labradoodle smell delicious, but it will also improve moisture on your dog’s moisture. The conditioning properties allow your doodle’s fur to be easily brushed free of mats and tangles. The mango and kiwi will help moisturize your Labradoodles dry skin, and the coconut oil stops anymore matting. The shampoo won’t interfere with tick and topical flea treatment and iy it is soap-free. Still wonder why this made our list of best shampoo for Labradoodles..? To help your Labradoodle’s dry skin, Veterinary Formula Solutions makes a moisture-rich nourishing shampoo. This is top on our budget pick of shampoo for Labroodles, and it’s the cheapest on this page. It costs only about $4 for an 18oz bottle. There’s nothing special or fancy here, it’s just a bare-bones product that gets the job done without causing trouble. It’s a soap-free product that uses oatmeal to clean and sanitize your pooch without causing harm to their skin. The infusion of buttermilk has a soothing effect (like the aloe vera) and will promote dermal recovery while moisturizing their skin at the same time. This is the only soap based product we are going to be talking about today. Over the years, sopa shampoos have earned themselves a bad reputation, but in reality, if your pooch doesn’t suffer from skin issues they are unlikely to get harmed when used properly. The cleaning power of natural shampoos is quite impressive, but they cannot compete with the power of a god old soapy shampoo. This pH neutral product will clean and deodorize your pooch better than any product on this page, and if your dog’s skin can handle it – you should seriously consider this product. This product is simply one of the best shampoo for goldendoodles out there. It is made by the same brand (Buddy Wash) and in all honesty, there’s not that big difference between the two products. The primary difference is that this is a calming shampoo that has been designed for anxious dogs that don’t like bath time. There are infusions of mint and lavender which can create an aromatherapy style experience for your pooch that calms nerves and makes them a little more relaxed throughout the entire bathing process. It sounds like a gimmick, but trust us, it works – and if your labradoodle really hates bathing, we think you should give it a go. 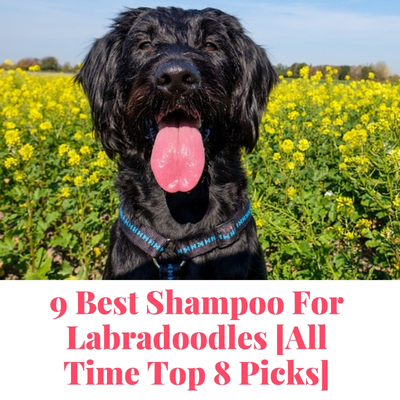 This is the most expensive product on this page, but it’s also one of the best shampoo for Labradoodles you will ever find anywhere! It’s a completely natural non-soap based product that comes with infused lemongrass in its formula to provide incredible cleaning power. The lemongrass will all together attack fungus and bacteria causing your dog to stink while providing them with a sharp and fresh scent that’s easy on the nostrils at the same time. If you’re looking for the best, we recommend you give this product some consideration. It’s not cheap at $15 for a similar sized bottle to the other products we’ve talked about today – but it’s a concentrated formula, so you need less per wash (which makes things a little more affordable). Labradoodles do not require regular bathing, but that doesn’t mean their coats aren’t high maintenance. It’s important that you brush your doodle coats at least once a week to keep up with the matting. Use the tips below for bathing your Labradoodle. Pick out all of your Labradoodles knots and mats before bathing them. Trying to remove the mats when they are wet or after bathing can cause more discomfort and pain. To ensure maximum comfortability, Use warm water to bath your Labradoodle during bath time. Start with a quarter-size amount of shampoo, and use more when needed. Instead of rubbing the shampoo into your doodle’s fur, squeeze it in to avoid further tangling. Avoid getting water and shampoo in your Labradoodle’s ears. Doodles are known for being vulnerable to ear infections. Rather than rubbing them down with the towel, Pat your doodle dry. Allow them to air dry, then brush them in one direction to help avoid tangling of their newly clean coat. In terms of size, Labradoodle can be miniature, medium or standard in size. They can grow to reach 14 to 24 inches in height and 25 to 65 pounds of weight. Labradoodle can be covered with: hair (wiry coat), wool (curly coat) or fleece-like, soft and wavy coat. Fur can be yellowish-brown, brindle, gold, reddish, black, or brown-colored. Labradoodle has more narrow muzzle than Labrador and an heavier body and more muscular forelimbs than Poodle. Labradoodle is mostly used to guide blind people. Aside from that, it is also frequently used as therapy dog. Labradoodle is intuitive, social and affectionate dog. It is very intelligent and able to quickly learn many things because of its natural impulse to please the owner. Labradoodle is suitable for the first-time owner. Labradoodle is an excellent choice for families with other pets and children. It likes to play and spend time with members of its family. Labradoodle should be kept in the houses with fenced yards. It requires 30 to 60 minutes of exercise per day. Labradoodle is excellent swimmer and it likes to swim if given the chance. Because of its friendly nature, the Labradoodle is not a good guard dog. Unlike in pure breeds of dogs, characteristics (personal and morphological traits) of Labradoodle are still non-standardized and unpredictable. Type of coat and personality of Labradoodle differ from dog to dog. Labradoodle can be smart, quiet and reserved as poodle, or immature and noisy like Labrador. Labradoodle has outstanding tracking skills. Recently, a Labradoodle proved that it can travel two counties to find its way home. It skipped 6-feet-tall fence and traveled 12 miles to find its owner. 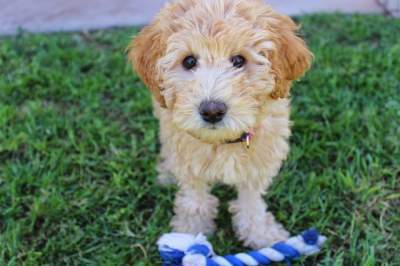 Tiger Woods, Jennifer Aniston, Norwegian Prince and Princess are proud owners of Labradoodle. Labradoodle with hairy fur sheds the most and it requires one or two brushing per week, like many other types of medium shedders. Labradoodle with fleece-like fur is odorless and it sheds minimally, but its coat has tendency to tangle and mat. Labradoodle gives birth to 4 to 15 puppies (8 on average). Labradoodle is generally healthy breed, but it can suffer from epilepsy, ear infections, hip and elbow dysplasia, and allergies. Labradoodle has an average lifespan of 12 to 14 years. You should bathe your Labradoodle every 6 to 8 weeks. Of course if your doodle gets into something smelly, it won’t hurt to give an extra bath. However, bathing your Labradoodle too often can lead to dry skin or other irritating skin conditions. If you notice your Labradoodle smelling foul and your current shampoo isn’t helping matters, try switching the fragrance or brand you use. You can also try using deodorizing spray between baths and grooming sessions to add fresh smelling scents to their coat. If these suggestions fail you and your doodle is still smelly, it may have a condition that needs veterinary attention ASAP! Infections can lead to an unwanted odor, in which case you will want to take your Labradoodle to see a veterinarian. So there you have it, our firsthand pick of the best shampoo for Labradoodles based on users experience and the market right now. Any of the pet beauty products we have talked about today can and will give you a super clean and happy pooch – without causing harm to their skin. We can assure you that you won’t be disappointed with the performance or value for money that any of them provide, and as such, they all get our total recommendation. So, Share this best dog shampoo for odor on Labradoodles post with family and friends. Support us by sharing this article on the best shampoo for Labradoodles on social media!